I was busy with my pregnancy, my brother's wedding and shifting back toIndia for good. At present I am enjoying motherhood completely. I have not updated this space for quite some time as I had severe aversion towards food and also since I have not been cooking regularly too ( Since my mom is doing all the cooking and I am enjoying eating them :P). Now coming back to cooking, This dish was prepared by my sister-in-law during her recent visit home. It was so simple and tasty that I had to share it. She made use of ready to use Chicken - 65 masala powder. (Even Kebab masala powder works fine) This serves as a great starter dish. 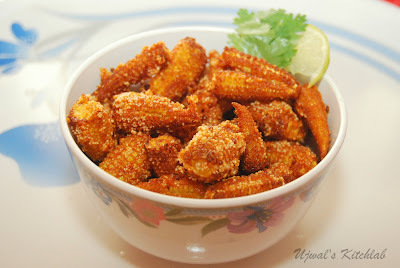 1) Cut baby corn into 2-3 pieces. 2) Marinate baby corn with ginger garlic paste and set aside for 30 mins. 3) Add the powders and salt to taste. Add little water. 4) Add enough rava to coat all the baby corn pieces. Deep fry in hot oil.